Doesn’t a Swiss workout sounds waaay more fun than sweating in the gym? We’re mid-way through January and how many of you have already broken all your diet/workout/promise to lose weight/ resolutions? And you know why? Because they are so NOT fun. If you want to burn off all that extra holiday poundage, I have one great tip for you. SWITZERLAND! Grab your best friend, and take to the Alps for some exciting Swisscentric activities. Work off those calories with some fantastic skiing, tobogganing or snowshoeing. If you’re in the mood for something that really gets the adrenaline racing, how about snow kiting? Slap on some skis or snowboard attached to a kite, and try some jumps at breathtaking speed. It’s highly recommended that beginners start with a course at The Snow Kite School. If you’re more like the tortoise than the hare, you might enjoy a good snow frolic with a Saint Bernhard dog. Every weekend, the Barry Foundation in Champex-Lac organizes winter hikes with those lovable Saint Bernard dogs. For a truly unique experience (complete with bragging rights) how about steering a snowcat? 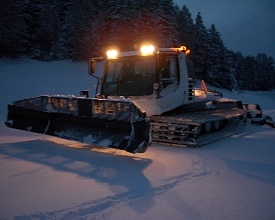 The snowcat wonder of Feldis weighs 7 tons, is 4.4 meters wide and is powered by a 240 hp engine. This is the stuff boys, big and small, dream about. Under expert guidance, visitors learn the basics of preparing ski runs and get to know the most important functions in the cockpit. Whoever meets the basic requirements will be allowed to steer a snowcat. The successful maiden journey will then be celebrated with an aperitif, and the novice driver is awarded a diploma.